Alcatel 1X hands-on: How's Oreo on 1 GB of RAM? Update, February 25: Alcatel informed us that some of the Alcatel 1X units that we were shown during the pre-briefing were reference devices running non-approved and incomplete software. 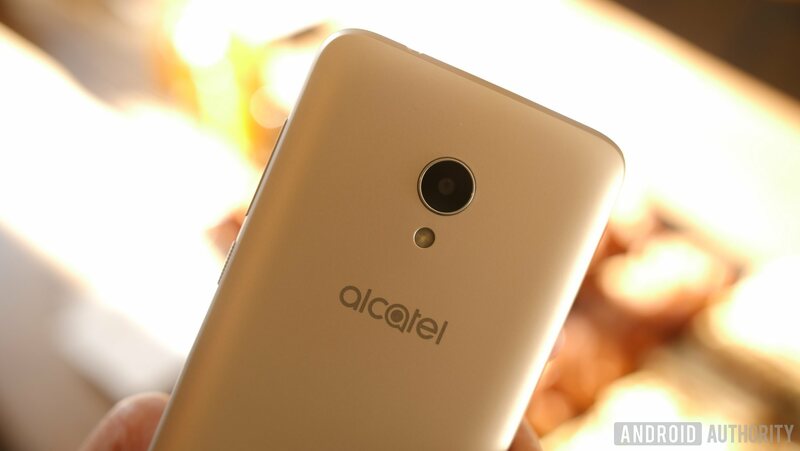 We will revisit the Alcatel 1X tomorrow and hopefully we can bring you some good news about its performance. Stay tuned. Original post, February 24: One of Google’s big initiatives for 2018 is Android Go, a lite version of Android 8 Oreo that is optimized for phones with 1 GB of RAM or less. Android head Hiroshi Lockheimer teased several Android Go devices coming at MWC 2018 and today Alcatel introduced the first one. The Alcatel 1X looks and feels as “budget” as you’d expect from a phone that retails for 100 euros, but its saving grace might be the fact that it actually runs Oreo. That’s not something that can be said about most phones out there, including some that cost seven times more than the 1X. How good is Oreo Go edition on the Alcatel 1X? If you were hoping for the answer to be “smooth as butter,” you’re in for a disappointment. Despite the optimizations and down-sizing, there’s a jankiness to the Alcatel 1X you just can’t get around. Loading the recent apps takes a noticeable moment and there are frequent instances of lag when scrolling through the app drawer or through a webpage. But! This is a phone that costs less than some people spend on a case! Besides the 1 GB of RAM, the phone features a quad-core MT6739 processor clocked at 1.28 GHz, 16 GB of onboard storage and a 5.3-inch 18:9 “VGA+” display. Considering these specs, it’s actually impressive to see Android 8.1 Oreo in the About section of the settings, and it’s even more impressive that Oreo Go edition is fully serviceable. One other thing to keep in mind is that the phones we tested at the Alcatel pre-briefing were pre-production units, meaning there’s still time for the company to stamp out performance issues before the public release. 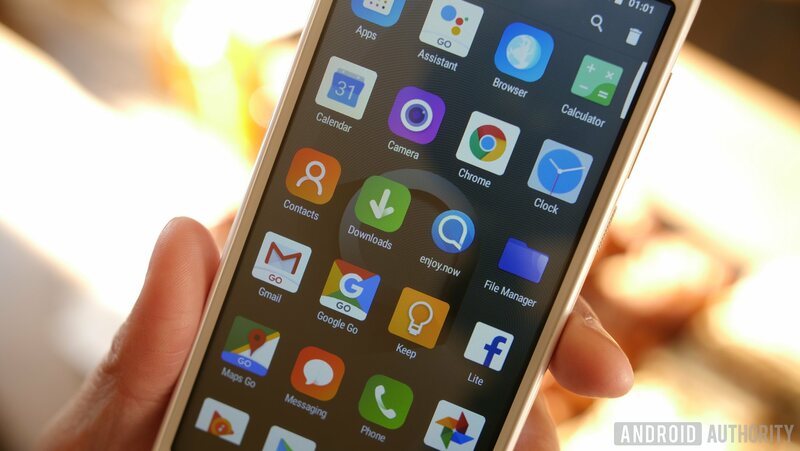 The operating system is just a part of the Android Go platform – the other main component is a set of slimmed-down Go apps, including Assistant Go, YouTube Go, and Files Go. We weren’t able to test these apps extensively, but in our short time with them, they did the job just fine. You won’t get the full experience you get with the regular versions, but that’s not really the point of the Go platform. Android Oreo Go edition addresses one of the biggest problems that plague the low-end of the Android smartphone market, which is the fact that customers rarely get the latest version of Android out of the box. The other big issues are the lack of security patches and the lack of OS updates. The 1X is a mixed bag in this regard: Alcatel says it will receive “regular Android security updates, on a minimum quarterly basis.” That’s not as good as the monthly cadence that high-end phones offer, but it’s a step above what cheap Android phones have offered so far in terms of updates, which is to say, nothing. Unfortunately, Alcatel had nothing to share when it comes to OS updates. Leaving Android Go edition aside, the Alcatel 1X comes in multiple variants, depending on the market: 1 GB or 2 GB of RAM, single-SIM or dual-SIM, fingerprint sensor or no fingerprint sensor, 8 MP camera or 13 MP camera, and even Google Assistant and no Google Assistant. The model with 2 GB of RAM features Face Key, a camera-based facial recognition feature. While it’s not as secure as PINs, patterns, or fingerprints, Face Key worked pretty fast and reliably in our time with the phone. Available in multiple colors starting in April, the Alcatel 1X will start from 99 euros for the single-SIM version and 109 euros for the dual-SIM model. At the end of the day, Alcatel and Google managed to put 2018 software on 2013 hardware and made them work together harmoniously, more or less. We look forward to seeing what other manufacturers were able to achieve with Android Go. Stay tuned for more coverage from MWC 2018 in the coming days.